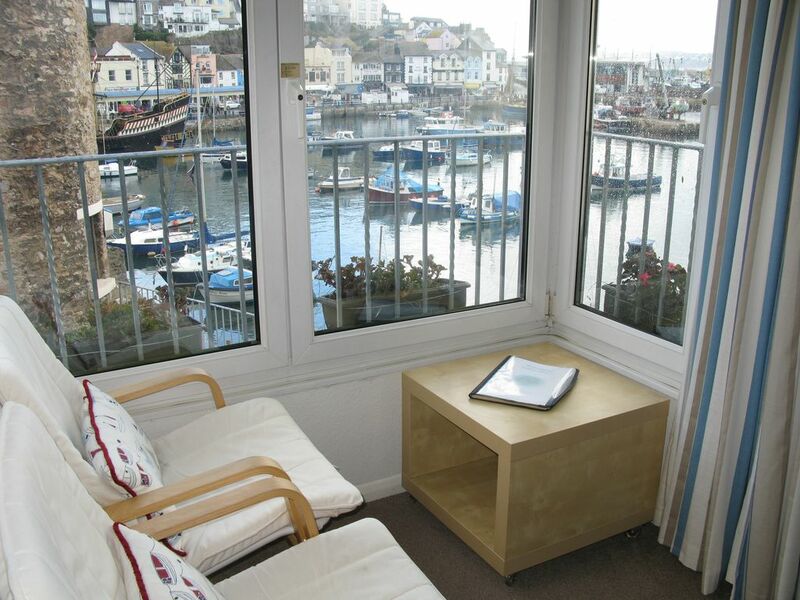 The cottage is on the quayside of Brixham harbour one of the oldest fishing ports in the UK. Sailors Haunt a self-catering quayside position cottage has direct and uninterrupted views over the harbour and towards Torbay with the added benefit of its own free private parking bay. In fact the cottage offers everything necessary for the perfect relaxing self catering holiday destination. Just a few metres from the water edge of the quay yet only a few minutes walk to the main shopping street in Brixham where you find a supermarkets like Tesco & the Co-op, shops and restaurants. Inclusive of a designated parking bay on the quay guarantees our guests a space to park their car after returning from a day out. The cottage has been modernised and tastefully decorated throughout. The gallery balcony in the lounge provides the perfect spot to enjoy the afternoon sunshine during the summer with a cup of tea or glass of wine, while also taking in the sights and sounds of the harbour activities and sea views beyond. Sailors Haunt has a double bedroom, lounge (with opening gallery balcony) and kitchen/diner, all have views overlooking Brixham harbour. There is also a second bedroom with custom made built-in adult size bunks (1900 x 900) all beds have Vi-Spring mattresses, a fully fitted family bathroom with a large walk-in shower, toilet , wash basin and a second separate toilet next to the bedrooms. From Brixham there are amazing walks along the coastal path to Dartmouth or Torquay and easy access to some of the UK's best walks. The cottage is equipped with its own quality bed linen & towels belonging to the cottage, free Internet Wi-Fi , landline telephone and full gas-fired central heating making it warm and cosy all the year round and included in the rental. This has to be the ideal place for a holiday anytime of the year. Summer bookings run from a Saturday each week. Short breaks are available of 3 or 4 nights and are only available from November to March (excluding Bank Holidays) and can run from any day of the week. Maggie and Richard purchased Sailors Haunt 01179676659 some 18 years ago which is situated right on the harbour and ideal for those short breaks away or for family members or friends . Sailors Haunt now is a Self Catering holiday home and each year during the winter personal touches and carful maintenance is carried out to make the perfect holiday home accommodation getaway. Brixham is full of charm and packed with attractions and activities for people of all ages. The replica of the Golden Hind is moored just across the harbour and there are several safe beaches, a seawater swimming pool and rock pools to explore and all within walking distance from the cottage. The coastal walk is amazing to Dartmouth. The South Devon coastal path is close at hand for those who want to experience the breathtaking views over the English Channel. You can book on the harbour boat trips and fishing trips that leave the daily. The Dart Valley steam train stops close by and you can climb aboard to experience train travel from a bygone era. It runs from Paignton to Dartmouth several times a day. There are many quaint towns and villages all within easy driving distance and there are several local bus routes for those who want to leave the car behind. There are also many National Trust properties throughout South Devon. The gallery balcony, catches the afternoon sunshine has opening patio doors with safety railings, enabling guests to sit in the sunshine and enjoy fantastic views of the inner and outer harbours, the marina and breakwater and beyond across Torbay to Lyme Bay, easily visible on a clear day. Sleeps up to 4 guests in two bedrooms. It is ideal for couples or families but not suitable for children under 5 due to safety reasons with its open plan layout. Sorry but In the interests of all guests staying at the cottage we have a NO SMOKING and NO PETS policy for Sailors Haunt. toilet, shower, Heated towel rail, ample storage space, illuminated mirror. The modern, fitted main bathroom is fully tiled with a large walk-in shower, toilet, Shaving mirror, washbasin, heated towel rail and illuminated mirror, hand & shower soap dispensers. There is also ample storage in the fitted cupboards and plenty of towel hanging space. An additional toilet is positioned adjacent to the bedrooms on floor above. The Quality Linen belongs to the cottage and is of a luxury cotton bedding. FREE dedicated parking bay on the quayside in view of the cottage just a couple of minutes walk to the cottage for your car. Quality towels for use inside of the cottage only. Spacious lounge on the first floor with a comfortable corner suite, easy chair and fitted carpets. Additional seating in the gallery balcony window and has opening patio doors overlooking the harbour. Kitchen/diner with built in units, integrated fridge/freezer dishwasher, built-in electric oven with ceramic hob and microwave. Equipped for a self catering holiday for four people. Large extending table and four chairs in kitchen/diner. There are flat screen televisions in the lounge, kitchen/diner and main bedroom. The cottage has a galleried balcony enabling guests to sit and take advantage of direct views over the harbour and Torbay even when the weather is not so good. The cottage is laid out over three floors with two staircases. It also has two steps into the front door. Unfortunately, this will limit wheelchair access. Thank you for your comments. At Sailors Haunt we try our best each year to maintain the high standards of the accommodation for the enjoyment and comfort of our guests. Easy walking distance to the shops, restaurants and inns. Local beaches, rock pools and a seawater swimming pool are all just a few minutes walk away. Other beaches are close at hand at Paignton, Torquay and Goodrington. Brixham has a large marina within easy walking distance where you will also find the breakwater and the Lifeboat station. The harbour walkway is landscaped by the Brixham Volunteers and add to the overall beauty of the area. Paignton train station 15 minutes by taxi to the cottage. Coach/bus services into Brixham centre approximately 5 minutes walk to the cottage. Brixham has a quaint main shopping street where you will find supermarkets, banks, a post office and many independent shops. There are also lots of shops around the harbour where holiday makers can find gifts and keepsakes to take home. There is a regular market held on the harbour side at the old fish market where local artists sell their crafts and paintings. Brixham is becoming a gastronomic destination with many restaurants opening up. There are also a number of pubs offering good meals. All of these are in easy walking distance from Sailors Haunt.